Scorpio Zodiac OhSoy! Mason Jar Soy Candle 16oz. 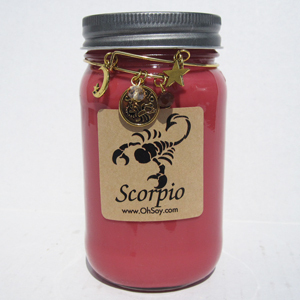 16oz Mason Jar Soy Candle - Candle includes a removable Scorpio charm bracelet. Scent Description: Pomegranate, strawberries, raspberries, hint of fresh peppermint leaves & vanilla. All of our OhSoy! soy candles are hand-poured at the Jersey Shore! Burn Time for our 16oz mason jar is approximately 100 Hours.